BUT FIRST SOME THEORY One can never have enough margin to safety. And brakes are one area where you don't want to run out of margin. When it comes to brakes these margins are wholly dictated by brake temperatures, be it the rotors, the pads, or the fluid. 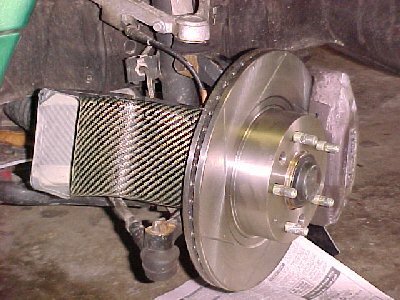 Brake fade can be attributed to overheating pad material in part due to exceeding the heat sink capability of the rotor itself. Without anywhere for the excess heat energy to go it goes to the pad material which subsequently overheats...and we get brake fade. Given the speeds one can see on the track and the limited range of brake pad material that can withstand the demands on the track of a 3000lb vehicle with OE calipers any means of reducing brake temperatures would be beneficial. A way to cooler brakes is by ducting ambient air to the brake components most susceptible to overheating. 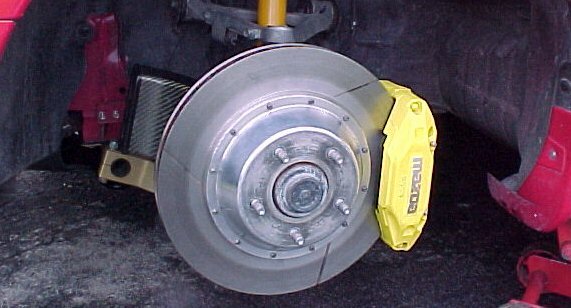 The most common means is to direct cool air to the eye of the brake rotor. 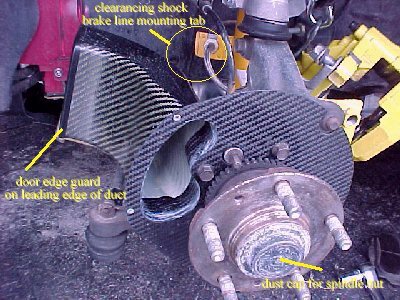 The air is then drawn through the rotor by the internal vanes between the rotor faces thereby cooling the braking surfaces and subsequently reducing brake pad temperatures. So given all this, enter the Crooked Willow Composites designed brake ducts. These brake ducts perform the above function by scooping cool air from within the pressurized wheel well and directing it straight to the eye of the brake rotor. They are not true dedicated ducting in the purest sense of the term because they do not draw their air supply from the nose of the car but instead rely on the air pressure built within the wheel well. And for those of us with the R1 brake ducts there is ample differential pressure to drive airflow through the CWC duct. 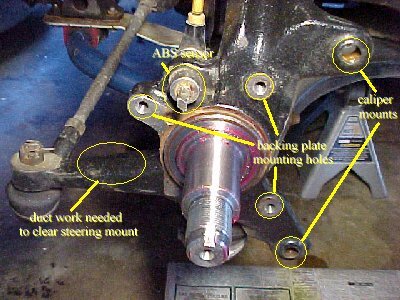 Even though I have a big brake setup I believe that even the stock brake rotor setup, with the correct brake pad, would be quite sufficient for any slightly modified track vehicle thereby negating the absolute need to go rushing off and drop $2000 for big brakes. I must begin by saying the CWC Kevlar Reinforced Carbon Fiber Duct have been very well crafted and literally weigh next to nothing. By my estimate only several ounces a side. I thought the box was empty when I received it in the mail! Essentially the duct consists of a scoop bonded to a backing plate that replaces the OE metal splash shield/duct. The OE "duct" is somewhat ineffective in directly air to the rotor because it's vestigial duct does not extend outside the area enclosed by the wheel itself. Of the 5 of us that purchased the CWC ducts we can attest to the fact that they did fit all our brake setup with some minor fitment. These brake setups included, the stock brakes, Mandeville 13" rotors with OE calipers, M2 Wilwood 6 piston caliper with 13" rotors, and the Mov-it Porsche "Big-Reds" with 12.75" rotors. The backing plates for the big brake setups were cut down to fit more effectively inside the rotor eye, whereas the backing plates for the stock rotors were designed simply to mount flush with the rear face of the stock rotor. Installation requires removal of the brake caliper (you can hang it from the suspension arm using a large "S" hook to the hard line on the back of the caliper. Do not let it hang by the brake line! ), brake rotor, and the wheel hub carrier and bearing assembly (which also carries the ABS sensor trigger wheel). This to facilitate removal of the OE splash shield and installation of the CWC duct. The hub carrier is removed by popping off the ducts cap (don't bend it! ), bending out the stake on the spindle nut (make sure you re-stake the nut when reinstalling), and removing the spindle nut (1 3/8" socket). Don't worry about the bearings as they are a sealed unit and will come off with the hub. The ducts are mounted using the 3 OE mounting bolts. Now for the fitment issues. Some may need to open up the mounting holes and ABS sensor hole in the CWC backing plate to allow snug fitment of the backing plate to the spindle carrier. This can be done carefully using an ultrafine file. In my case I also needed to remove some material to allow the duct to sit correctly over the steering arm mount. Additionally I added spacer washers between the backing plate and the hub to get the backing plate to seal tighter to the eye of the rotor. Also as added protection, although the kevlar is very tough I used door edge guard on the leading edge of the duct to protect the unfinished carbon fiber. What the 5 of us did notice when installing these ducts was that each and every one of our cars was different. Similarly because the CWC ducts are a custom part for a modified vehicle there are some slight differences from duct to duct. So each of our cars required some minor fitting. 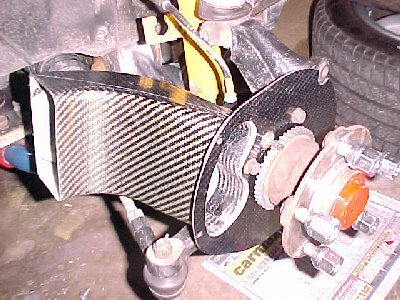 For example on my vehicle it was the shock brake line mounting tabs that needed to be shaved to avoid contact with the duct at full lock (see below). On Paul Obers car the duct hits the steering link at full lock. On the cars with OE brakes the CWC backing plate had to be shaved to provide clearance for the brake pad in the OE caliper. All minor annoyances but not insurmountable obstacles.